Garage Project is an independent New Zealand brewery based in Aro Valley, Wellington. The brewery was founded in 2011 by brothers Ian and Pete Gillespie and Jos Ruffell, who transformed a dilapidated car garage and began brewing 50 litres at a time. Today the business is flourishing, has won numerous awards for the many beers it produces and has recently commenced the production of natural wines. 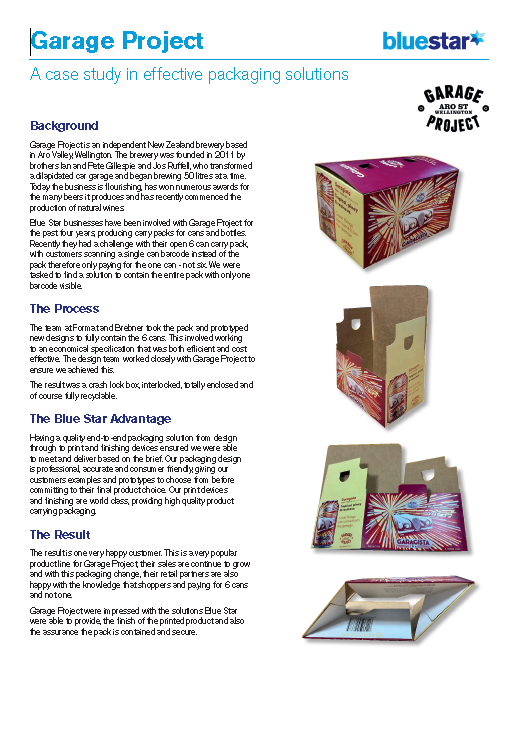 Blue Star businesses have been involved with Garage Project for the past four years, producing carry packs for cans and bottles. Recently they had a challenge with their open 6 can carry pack, with customers scanning a single can barcode instead of the pack therefore only paying for the one can - not six. We were tasked to find a solution to contain the entire pack with only one barcode visible.